Right off the heels of announcing an expansion of its Kindle Digital Text Platform to authors and publishers around the world, Amazon announced back in January that it would introduce a new 70 percent royalty option in the program that will allow them to to earn a larger share of revenue from each Kindle book they sell. Well, it’s the middle of the year, and it has now landed. For the record: the new royalty option comes will not replace the existing DTP standard royalty option but rather complement it. As could be expected, option is currently only available for books sold to United States customers. The new royalty option basically means that for each book sold from the Kindle Store for Kindle, Kindle DX, or one of the Kindle apps for iPad, iPhone, iPod Touch, BlackBerry, PC, Mac and Android phones, authors and publishers who choose the new royalty option will receive 70 percent of the list price, net of delivery costs. Those costs are based on file size (pricing is set at $0.15/MB), and Amazon claims today’s median DTP file size to be 368KB, which means delivery costs would be less than $0.06 per unit sold. – The author or publisher-supplied list price must be between $2.99 and $9.99. – The list price must be at least 20 percent below the lowest list price for the physical book. – The title is made available for sale in all geographies for which the author or publisher has rights. 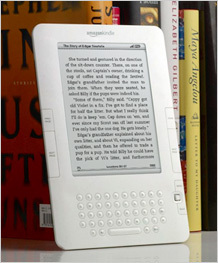 – The title will be included in a broad set of features in the Kindle Store, such as text-to-speech. This list of features will grow over time as Amazon continues to add more functionality to Kindle and the Kindle Store. – Under this royalty option, books must be offered at or below price parity with competition, including physical book prices. In addition to the 70 percent royalty option, Amazon also announced improvements in DTP such as a more intuitive “Bookshelf” feature and a simplified two-step process for publishing.